The Prime Minister stresses on project developments at Itanagar in Arunachal Pradesh. The Prime Minister Narendra Modi has laid the foundation stone for seven Extra High Voltage (EHV) Sub-stations and 24 Low Tension (LT) Sub-stations in Itanagar, Arunachal Pradesh, on 9 Feb 2019. The project is a major step towards meeting the national objectives of affordable 24X7 power to all, especially in the remote locations of Arunachal Pradesh. The project is being implemented by Power Grid Corporation of India Limited (POWERGRID) a ‘Navratna’ Company under Ministry of Power. The project will give impetus to the inclusive growth by enhancing the consumers’ access to reliable and affordable grid connected power supply. It will lead to reduction in operation of Diesel Generating Plants in Arunachal Pradesh thus bringing socio-economic and environmental benefits to the people of Arunachal Pradesh. The project will also facilitate in development of small scale/cottage industries/tourism in the region and boost economic growth by enabling supply of quality power. Further, the project will give impetus to integration of upcoming Hydro Power Generating Plants in Arunachal Pradesh with the National Grid and will facilitate lying of optical fiber (33 kV) to help extending communication facility to the small towns/villages. It shall boost local economy of the entire state with infusion of about Rs. 6501 crore and also by creating opportunities for long-term support of the new infrastructure. The present per capita power consumption of state is 233 kwh against national average of 1,075 kWh. The existing Power Transmission and Distribution system needed a major reconstruction and integration with National Grid to meet the present and future load requirement as well as to fuel faster economic growth. Contracts for construction of 18 132/33 kV Sub-stations, 1,716 km of 132 kV Transmission Lines and 46 33/11 kV Sub-stations with associated 33 kV lines of 1,202 km have been awarded. The construction activities in 13 132/33 kV Sub-stations, 21 33/11 kV Sub-stations and associated lines under the awarded contracts have already been commenced. The Comprehensive Scheme for Strengthening of Transmission & Distribution (T&D) Systems in Arunachal Pradesh was sanctioned on 10 October 2014 under Central Sector Plan Scheme of Ministry of Power at an estimated cost of Rs.3,199.45 Crores (at April 2013 price level) to be funded by Govt. of India. 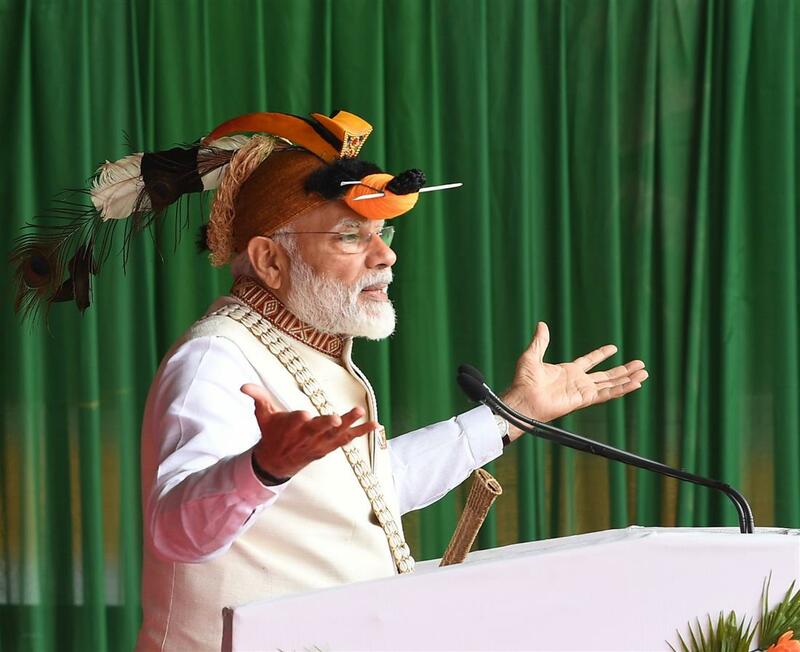 As a part of his visit to Arunachal Pradesh, Assam and Tripura, Modi laid foundation stone for Greenfield Airport at Itanagar and Sela Tunnel as well as unveiled several other development projects in the state. He said: “Today I got opportunity to unveil projects worth more than Rs 4000 crore”. Additional projects, worth Rs.13,000 crore, are in progress in the state, he added. The Prime Minister laid the foundation stone for the construction of Greenfield Airport at Hollongi and inaugurated retrofitted Tezu airport. The terminal at Hollongi will be constructed at a cost of Rs.955 crore with an area of 4,100 sq m and has peak handling capacity of 200 passengers per hour. “Tezu airport was built 50 years back but no government envisioned to connect people of this state with other parts of the country. We expanded the airport by spending around Rs.125 crore for this small airport,” said Modi. Tezu airport is ready to give services to the people of Arunachal, he added. Prime Minister laid the foundation stone of Rs.700 crore Sela Tunnel which will provide all weather connectivity to Tawang Valley and reduce the travel time to Tawang by an hour. Government is working on almost Rs10,00 crore worth of projects for improving connectivity of the state. The work on Trans Arunachal highway is also under progress. Modi also dedicated 110 MW Pare Hydroelectric Plant in Arunachal Pradesh to the nation.